The communities of species that reside in aquatic ecosystems reflect the regional species pools (themselves a product of biogeographic history), and the species' abilities to colonize and survive. The bounds of environmental variation established by flow, sediment, thermal, light, and nutrient regimes, and the presence of and interactions with other species in the system, dictate the suitability of the ecosystem for any particular species. 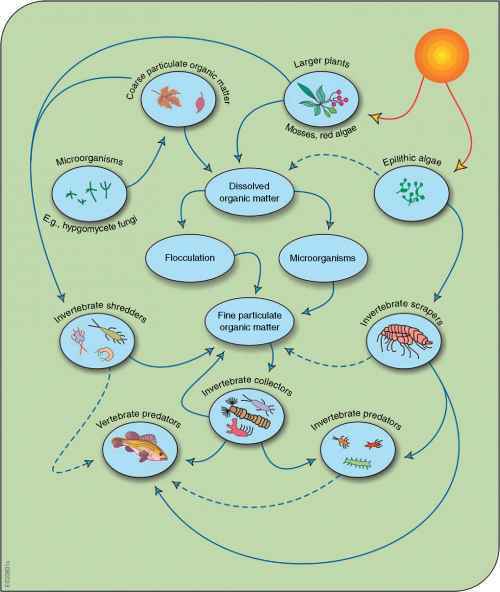 Thus, both biotic and abiotic controls and feedbacks operate to maintain a diverse range of species that are involved in the critical ecosystem processes of primary production, decomposition, and nutrient cycling. The capacity to adapt to future environmental variation is, in part, underlain by the apparent functional redundancy of ecological functions performed by species. High apparent redundancy (i.e., biodiversity) affords a kind of insurance that ecological functions will continue during environmental stress. In constantly changing ecosystems like stream and river corridors, the stability of a system is its ability to persist within a range of conditions. Within this range the system is resilient. This phenomenon is referred to as dynamic equilibrium. The maintenance of dynamic equilibrium requires a series of self-correcting mechanisms in the stream corridor ecosystem. These mechanisms control the responses to external stresses or disturbances within certain ranges. The threshold levels associated with these ranges are often difficult to identify and quantify. If they are exceeded, the system can become unstable. Corridors may then undergo a change toward a new steady-state condition, usually after some time for readjustment has occurred. Many stream systems can accommodate some disturbances and still return to functional conditions once the sources of the disturbances are removed. Ecosystems tend to heal themselves when external stresses are removed. The time it takes to do this, of course, depends on the level of stress. 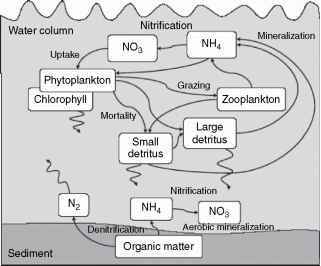 Figure 10 Interactions among aquatic organisms and their sources of energy. (Dashed lines reflect weaker interactions.) Modified from Loucks DP and van Beek E (2GG5) Water Resources Systems Planning and Management. Paris: UNESCO.